1This book was born from my experience with nationalism and war in the former Yugoslavia. It has been further shaped by both my political experiences in Croatia under the Tudjman regime and by political and philosophical reflections on the issues of national identity, culture, and politics. It is intended to introduce the reader to the contemporary moral and political debate on nationalism, from a standpoint that is critical of nationalist views. It is thus both an introduction and a polemic with a postulated ‘thoughtful nationalist’, not a sociological investigation into causes and roots. Confrontation with this postulated ‘thoughtful nationalist’ occupies center stage; such a nationalist would defend the view that states should be organized on an ethno-cultural basis; that cultural and intellectual life should be officially organized around ‘national’ culture; that individuals have basic duties and obligations to their nation; and that such duties normally trump many other moral obligations. The book presents and attempts to answer the standard arguments of such nationalists and criticizes their views. 2I have divided the arguments to be discussed into two groups. In the first group are the more narrowly political ones, having to do with issues of self-determination and with the alleged democratic credentials of nationalism. The second group is more philosophical, and centers around the relation between ‘national identity’ and various goods, such as the free flourishing of individuals, moral insight, and the cultural goods that traditions offer to individuals who participate in them. Does national identity really provide such goods, and is it a better provider than some alternative identities? This is the question which occupies most space in the book. The arguments addressed appear in nationalist literature and political discourse, often concealed by a great deal of rhetoric; they also make their appearance in serious philosophical literature. This brings me to a particularly important point about this book. 3The biggest intellectual problem that I have encountered in writing the book has to do with the recent resurgence of very mild forms of nationally minded philosophical thought. A year ago, when putting together my anthology on ‘nationalism and ethnic conflict’ (Miščević, 2000), I noticed that most authors eager to write about the topic were at least sympathetic to nationalist movements, whereas philosophers who are less sympathetic simply tend not to write about nationalism at all. Now, this philosophical pro-nationalism is vastly different from anything I know as nationalism from my personal experience: it is liberal and generous, allowing all sorts of concessions that no one whom I would classify as a political nationalist would ever accept. All of the authors who see themselves as liberal nationalists are well aware of the painful realities of nationalist conflicts. They react to them by trying to exculpate nationalism and dissociate it, as such, from the aggressive forms made manifest in these conflicts. In their eyes it is not nationalism as such that is responsible, but the fact that the nationalisms in question were not liberally minded. Some of them go as far as claiming that nationalism is originally, or considered in itself, liberal and democratic (whereas others see themselves as proposing liberal limitations on nationalism). Since such mild pro-nationalism—which I am not at all sure is ‘nationalistic’ in any real sense—seems to occupy center stage among serious philosophical papers on the subject I was faced with an unpleasant dilemma. I could either ‘join the club’, and put mild pro-nationalism at the center of this book, discussing it at length and trying to show its shortcomings. In that case, the book would have been philosophically more ‘in tune’ with the academic mainstream, but it would not have reflected actual political life in countries with ruling nationalistic parties. Instead, I have focused on a more typical nationalist attitude, much tougher than the one popular in academia, but more common in everyday life. I have done so in the belief that my debate with nationalism should reflect political realities, rather than adapt itself to the mild climate of gentle and liberal academia. I have tried to do justice to ultra-moderate, ‘liberal nationalist’ philosophers by discussing their views in a separate chapter, but I am aware that the richness and variety of their positions would merit more space, and I apologize to them for not placing their views at the center of the discussion.I have learned a lot from many authors, and perhaps most of all from those I criticize. I owe a special intellectual debt to Judith Lichtenberg: her paper on varieties of nationalist arguments (listed in the bibliography) gave me the idea of organizing this book around particular pro-nationalistic arguments. For discussion and criticism I wish to thank professors Kevin Muligan, Barry Smith, Andrew Oldenquist, Philip Pettit, Allen Buchanan, Alan Montefiore, János Kis, and Will Kymlicka; for direct help with the manuscript and its publication my colleagues Ferencz Huoranszki, Loránd Ambrus Lakatos, Nenad Dimitrijevic, Thomas Simon, Markus Haller, and Michelle Gadpaille; and most directly, the enthusiastic team at CEU Press. Special thanks go to the efficient and insightful copy-editor James Patterson. I have been discussing nationalism for years with Friderik Klampfer of Maribor and Miomir Matulovic and Elvio Baccarini of the University of Rijeka. For their hospitality I thank my hosts in Switzerland and Austria, professors Edward Swiderski, Lidija Basta and Peter Koller. I have also profited a great deal from talks at courses and conferences in France and Turkey organized by Ghislaine Deval and Sandra Aidara of Transeuropéennes. MISCEVIC, Nenad. 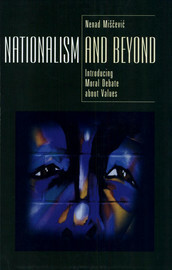 Preface In : Nationalism and Beyond : Introducing Moral Debate about Values [en ligne]. Budapest : Central European University Press, 2001 (généré le 26 avril 2019). Disponible sur Internet : <http://books.openedition.org/ceup/458>. ISBN : 9789633860083. Miscevic, Nenad. “Preface”. Nationalism and Beyond : Introducing Moral Debate about Values. By Miscevic. Budapest : Central European University Press, 2001. (pp. XI-XIII) Web. <http://books.openedition.org/ceup/458>. MISCEVIC, Nenad. Nationalism and Beyond : Introducing Moral Debate about Values. Nouvelle édition [en ligne]. Budapest : Central European University Press, 2001 (généré le 26 avril 2019). Disponible sur Internet : <http://books.openedition.org/ceup/440>. ISBN : 9789633860083. Miscevic, Nenad. Nationalism and Beyond : Introducing Moral Debate about Values. Budapest : Central European University Press, 2001. Web. <http://books.openedition.org/ceup/440>.